Today i have come up with a healthy stuffing i.e Cauliflower Masala for Dosa. If you are bored of by eating the same potato stuffing for dosa it is a must try dish. Easy as well as tasty combo with crispy dosa. 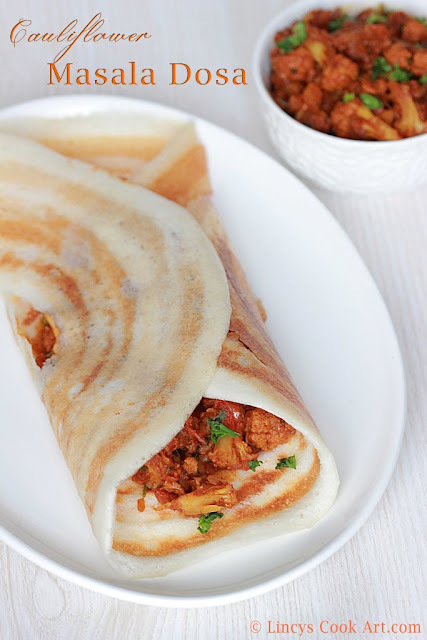 You will not require any chutney or sambar to pair with this masala dosa as it is spicy masala. A real treat for the vegetarians a nice variation for the regular masala dosa. You could check my other dosa with different fillings such as Mysore Masala Dosa, Masala Dosa, Beetroot Masala Dosa, Broccoli Masala Dosa, Pav Bhaji Dosa, Paneer Masala Dosa, Mushroom Masala Dosa, Chicken Masala Dosa, Nutella Banana Dosa and Palak Paneer Dosa. For this filling you could precook the cauliflower and add into the gravy or you could add as such and cook in the gravy till soft. Add the chopped tomato and cook till soft and mushy. Add some salt to taste. Add the masala powders turmeric powder, red chilli powder, coriander powder and garam masala powder; mix well and cook for thirty seconds to relieve the raw masala smell. Add some water and allow to boil well. Once the masala cooks and the oil starts to separate on top, add the cauliflower and mix well. Close with a lid and cook till the cauliflower cooks till soft. Open the lid and allow the gravye from the masala dries out and become thick gravy. Check for salt and sprinkle some coriander leaves and switch off the gas. To make cauliflower masala dosa, heat dosa tawa and grease with oil spread a ladle full of dosa batter into concentric circles. Drizzle little oil on top and cook till crispy. Keep 3 tablespoons of cauliflower masala and close the dosa as desired.